THUNDER BAY, ONTARIO - August 18, 2018 (LSN) Bundaries of the Ministry of Natural Resources and Forestry’s ongoing Restricted Fire Zone – which are a bit convoluted in the Thunder Bay area. Attached you find a PDF and a JPG version of a map that we hope your organization might share with your viewers/readers, as well as a link to our online mapping tool where the public can get a more detailed visual impression on which areas in the Thunder Bay District are included in the Restricted Fire Zone and which areas are not. · Portions of the Thunder Bay, Red Lake and Sioux Lookout Districts. Residents outside the Restricted Fire Zone are urged to check with municipal fire department for local burning restrictions. There were three new fires confirmed in the Northwest Region by the mid-afternoon of the Aug. 18. At the time of this post there were 64 active fires in the region. Five of those fires were not under control, three fires were being held, four fires were under control and 52 were under observation. · Thunder Bay Fire 55 is located near Collins Lake, approximately 29 kilometres west of Armstrong. The 0.1 hectare fire is not under control. · Fort Frances Fire 58 is located near Manion Lake, approximately 53 kilometres northwest of Atikokan. The fire is not under control at 0.2 hectares. · Sioux Lookout Fire 121 is located on an island on Cat Lake, approximately 10 kilometres south of the community of remote First Nation community of Cat Lake. The one hectare fire is not under control. 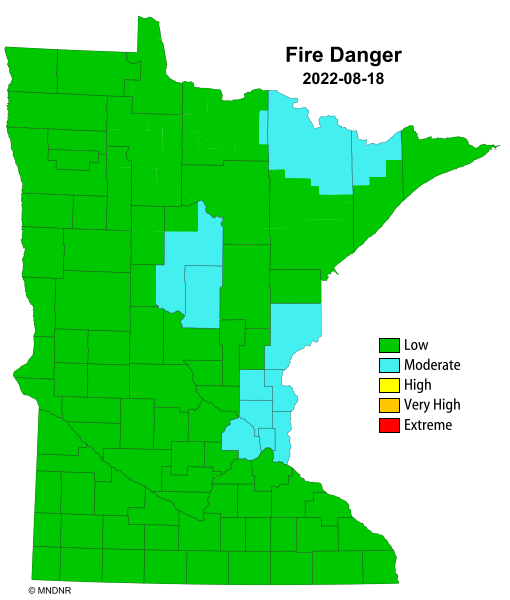 The fire hazard is currently extreme throughout the Kenora District and in portions of the Red Lake, Fort Frances, Dryden and Sioux Lookout Districts. High hazard conditions prevail throughout the rest of the region with the exception of a pocket of moderate hazard on the North Shore of Lake Superior in the Nipigon District. Smoke from large fires in in Western Canada and the United States continues to drift east and will affect areas throughout Ontario for today. Communities in close proximity to some of the larger monitored fires in the Red Lake, Sioux Lookout, and Thunder Bay Districts may experience smoke drift from these fires. Concentration levels could be high at times, but not expected to persist for a long duration. For information about the impacts smoke on your health please contact Telehealth Ontario at 1-866-797-0000. Several large fires in Woodland Caribou Park have necessitated some restrictions for backcountry travellers. Ontario Parks is restricting access to some canoe routes as well as access to a number of lakes.